Copies an input data set to one or more output data sets. 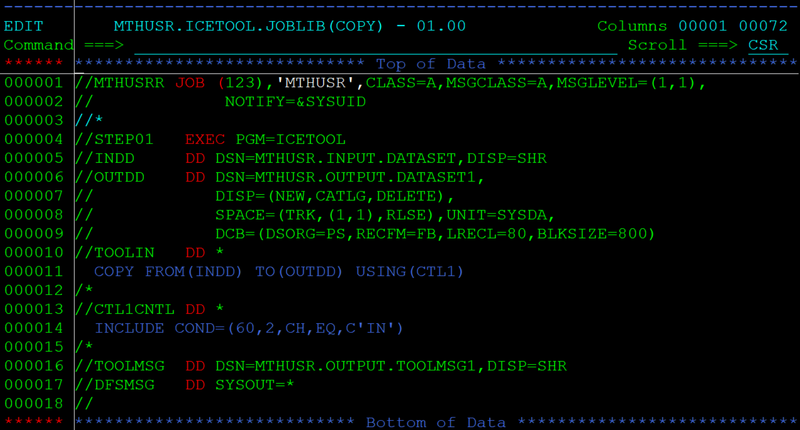 Copies the indd data set to the outdd data sets (up to 10). JKFROM must provide for USING(xxxx) operand. Specifies ddnames of 1 to 10 output data sets. Specifies first 4 characters of the ddname (xxxxCNTL) for the DFSORT control statement data set. Below example to copy the employee records to output dataset whose country is ‘IN’(from 60th column of length 2). COPY FROM(INDD) TO(OUTDD) USING(CTL1)	- Copies the data from INDD to OUTDD based on the USING condition specified in CTL1.